European lobster range from Scandinavia to North Africa, inhabiting sub-tidal waters of the eastern North Atlantic Ocean, the Mediterranean Sea and the Western Black Sea (Prodöhl et al. 2006) . Genetic differentiation among populations is weak overall, but distinct groups have been identified in four locations: northern Norway, Netherlands, remaining Atlantic, and the Aegean. 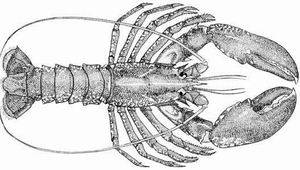 Six "Lobster Fishery Units" (LFUs) have been defined for purposes of assessment and management of the species in English waters: Northumberland and Durham, Yorkshire Humber, East Anglia, Southeast South Coast, Southwest and Northwest (Masefield et al. 2017) . A data comparison of the non-target species caught across the UK Western Channel and Celtic Sea crustacean pot fisheries.